The search for permission to hunt private land should begin months before the hunting season. You need permission to hunt on private agricultural land even if it is not posted. Mark attractive hunting areas on a county or topographic map, and then find out who owns the property. Get permission early. Phone the landowner ahead of time to explain who you are and why you are calling. Inquire as to the best time to visit the landowner to discuss your request. Keep in mind that in most cases you will be visiting the landowner's place of business. Be polite and friendly, sincere and brief. 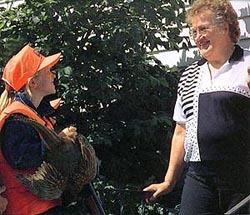 Express your willingness to help with odd jobs, such as hauling wood or mending fences for the landowner in exchange for the privilege of hunting. If your request is denied, try to be understanding and remain polite. 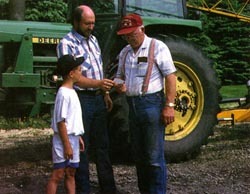 Your reaction could have an important bearing on future interactions with the landowner. A landowner who allows persons onto his or her land free of charge for recreational purposes (including hunting), as defined by Minnesota Statutes chapter 604A, is generally not responsible or liable to such persons for injuries or damages they might sustain while on the land. For complete details, please refer to Minn. Stat. Ch. 604A.20-604A.27. Respect the landowner's property as you would your own. Don't litter. Carry away litter left by others. Understand clearly where you can and cannot drive or park your vehicle and abide by those restrictions. Leave your name, address, phone number and also make, model, and license number of your vehicle with the landowner. Some hunters have found it is well worth their while to have such cards printed up before the season. If you have permission to return, find out if there are certain times or places that you should avoid. Always attempt to let the landowner know where you will be and when. Know the property boundaries of the land you have permission to hunt and stay within those boundaries. Try to keep the size of your hunting party small and always let the landowner know exactly who else will be hunting with you. Think before you shoot. Know your target and what is beyond it. Don't walk through unharvested crops or hunt near livestock or buildings. Leave gates as you find them. Cross fences in a manner that will not break or loosen wires or posts. Keep your dog under control, especially when near domestic animals or livestock. Do not build or start fires at any time, unless you have specific permission from the owner. Do not cut, injure or permanently mark trees with an axe, nails, or spikes. Remember that you are a guest on another person's property. Make an effort to express your appreciation for the opportunity to hunt the land. Let landowner know when you have completed your hunt. The landowner may want to let others hunt on their land. Offer to share any game (cleaned) with the landowner. At all times remember that landowners who give you permission to hunt their property are doing you a favor.